Not even a month into our Thursday night movie series, we’ve decided to change it up. Fourth Thursdays will henceforth be WEIMAR NIGHT (not miscellaneous). Because, really, what the series was lacking was a little historical perspective, a little moody chiaroscuro, a little class. And, anyway, what good is watching films in a back alley basement if they’re not occasionally going to contain some underworld types threatening each other in German, amirite? Sandwiched in between two rather regrettable wars, Weimar Germany may best be remembered for hyper-inflation, sexual deviancy, and mind-blowing cinema. 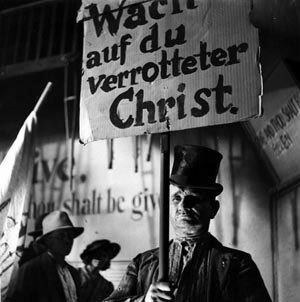 Just as pre-code Hollywood was coming into its own, German auteurs like F. W. Murnau, Fritz Lang and G. W. Pabst were pushing every known convention and churning out unforgettable films of urban decay, expressionist tableaus, and human depravity. Weimar Night kicks off with Die Dreigroschenoper (The Threepenny Opera), G. W. Pabst’s adaptation of Bertolt Brecht and Kurt Weill’s legendary musical. Pabst, who had made his reputation with films like Pandora’s Box, was known for his depictions of venality and perversion, and is in fine form here with the story of Brecht’s anti-hero and the most palatable screed against capitalism ever set to jaunty music. Even before it was Bobby Darin-ified into “Mack the Knife,” the film’s “Moritat for Mackie Messr” remains the catchiest little ditty about a mass murderer ever written (much to Nick Cave’s eternal chagrin). So where does that leave us with the whole movie night thing? – The first Thursday of each month will still be Bollywood Night, on which we will show, yes, Bollywood films. – The second Thursday is still Zombie Night, on which we will preview the upcoming zombie apocalypse. – The third Thursday of each month is still Keanu Night, showcasing the best work of one of our best actors, Mr. Keanu Reeves. – Every fourth Thursday will now be Weimar Night (see above). – And, finally, each time a month has a fifth Thursday, that will now be Miscellaneous Night. Sometimes that will be a choice selection from the Betalevel cinema archive and sometimes it will be videos made by locals, friends, acquaintances, and so forth. Or maybe it will just be our favorite Youtube clips of people dancing with cats. Who knows?